The other day, I was having a conversation with a mixed cohort at our library lunch club. We were discussing sports books, you’ll know the type – those formulaic novels or reading scheme books about a team who overcome an obstacle to triumph by winning the cup or moving up a league. Whether they focus on a less talented player come good, or a star player overcoming his loss of confidence, or an injury-stricken player making it in the end, they do tend to be of a type. There’s a comfort in that – repetition and formulas are a comforting part of re-reading and fixing narrative arcs in the mind, as well as reinforcing good messages about teamwork and attitude. But it is hugely refreshing when a book that’s ostensibly about ‘sport’ actually stands out from the crowd. On TV, Friday Night Lights did this spectacularly well. Compulsive, gripping and hugely sympatico. Now, Ghost does this for children in book format. Ghost was published in the US in 2016 to huge acclaim, spending more than 21 weeks on The New York Times bestseller list, and finally makes its debut appearance here thanks to new publishers on the block, Knights Of. Running is what Castle (Ghost) is good at. But he isn’t part of a squad or team; he doesn’t see it as a sport. The first time he had to run, it was away from his gun-wielding father. When he inadvertently ends up at an athletics team training session and beats the fastest kid there by running against him on the outside of the track, the coach sees his potential. But Ghost’s raw energy needs to be harnessed and disciplined in order for him to succeed at life, let alone as part of a running team. And that’s not all that easy. 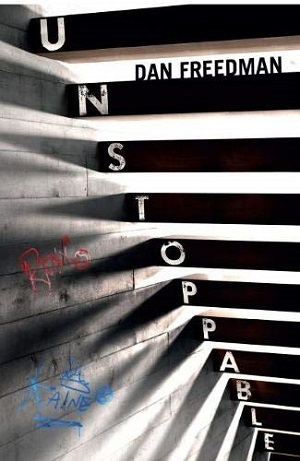 There are lots of themes running through this book that elevate it to much more than a sports novel. And most encouragingly, it doesn’t follow the formula in plot detail either. There is no grand competition at which Ghost must triumph, no injury to overcome. The focus is very much on Ghost himself, of committing to the training, of learning to get along with the rest of the team (they’re still a way off complete bonding). This is about personal development and circumstances, but all written in such a way that it will appeal to reluctant readers as well as proficient book-devourers. The main strand here is the father/son dynamic and relationship that springs up between Ghost and Coach, as well as the parallel of Ghost’s troubled and complicated relationship with his absent father. There’s also the class divide Ghost sees around him – where people live, how they dress and the privileges afforded to them; his own single mother working hard, a school system struggling to work with all its pupils. But perhaps the most endearing quality in this book is the fully rounded, witty, flawed, tempestuous and yet kind protagonist. Written in first person, and immediately identifiable, Ghost first introduces himself to the reader by explaining about his fascination with record-breaking facts, including the man who blows up balloons with his nose. Ghost is believable and fun, with unique traits – spitting sunflower seeds, watching from the bus stop as people bob up and down on the treadmills inside the gym opposite. He notices stuff, he has a great sense of himself, and a great sense of humour. 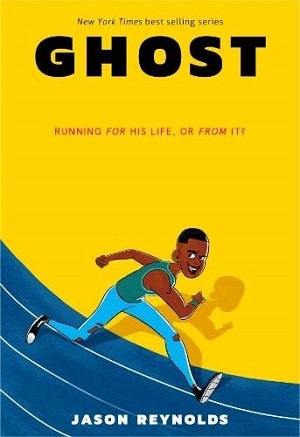 Of course Reynolds tracks Ghost’s development over the novel, using the model of race training and a no-nonsense coach to turn our hero into a somewhat hero (in the reader’s eyes maybe), delineating his flaws and exploring how the adults around him help him to overcome the obstacles he meets along the way. So there’s that trope of coach as mentor to troubled kid, but by using first person from Ghost’s point of view, Reynolds goes deep inside Ghost’s head – the vehement wish to own proper running shoes and where that takes him, the anger that bubbles inside, his outlet in running, and his need to be guided. All narrated with easy prose, at times in Ghost’s youthful, naïve and vulnerable outlook, at others with a childlike profundity that bursts through from nowhere, but always spilling over with energy and zest. Surrounded by a fully-realised team of secondary characters, both in his team track-mates, but also in the local shopkeeper and his long-suffering mother, this is an outstanding story about self-belief and hope. First in a series, you can buy it here. There is something special about this book, and I’m not sure whether it’s the message behind it, the story itself or the style of writing. It could be the combination of all three, although I’m edging towards the last, simply because it’s not often that I finish a book in one sitting – but this hooked me almost by magic. The prose is so faultlessly lucid, like the cascade of a clear waterfall, and I was spellbound by the fluidity with which the words flowed on the page. Fifteen-year-old Floyd is training to be a tennis champion – a talented and dedicated sportsman and the star of the under-eighteens circuit. The reader first meets him in the midst of a tennis tournament, and swiftly learns that tennis is his life and that he’s destined to be a professional tennis player. But as we meet Floyd, so Floyd sees Mike again, walking along the top row of tiered seating, his black coat billowing behind him (which rather made me think of Christian Slater in The Breakfast Club, with that haunting yet inviting look in his eyes). At first, Floyd thinks that Mike is a nuisance, an over-eager fan perhaps. But it becomes apparent to the reader, and to Floyd’s great surprise, that only he can see Mike. Before long, Floyd is seeing a psychologist to try to eke out why he is seeing ‘Mike’ at his tennis practice and during tennis matches. With straightforward clarity, Norriss and by default, the pleasantly authentic and sympathetic psychologist explore parental pressure, and life choices. There’s philosophy underpinning this story – a sort of moral guide to how we make choices, how we steer our lives through fate or instinct, and an exploration of our conscious and unconscious minds. Most particularly, Norriss touches upon our connections with other people and how that affects our journeys through life. With Floyd and Mike, the reader will come to understand a little bit about their own self – what we are doing for ourselves, or for others, and how to come to an understanding of serving both. But there is no heaviness to this novel, no preaching, no deep philosophy. Instead, with remarkable pace and with much humour and levity, the reader is steered through Floyd’s path – from tennis through to marine biology, and although written with a breezy simplicity, Floyd’s path is far from easy. Without delving too deeply into the angst, Norriss shows us the difficulties Floyd faces, the lessons he has to learn, the pain that sometimes must be experienced. Whether this is in part inspired by the movie Harvey with James Stewart (referenced in the text), or in part by Jiminy Cricket or other such fictional guides that give the character a steer through life, this is a fascinating look at finding oneself and one’s true desires and seeking and owning the power and responsibility to make one’s life’s choices. Norriss’s characters feel real and likeable, the book almost true in its matter-of-factness. I actually can’t recommend this book enough – it’s now out in paperback and I suggest you all read it – young and old. It’ll definitely make you think, and might turn the most reluctant reader into a reader. 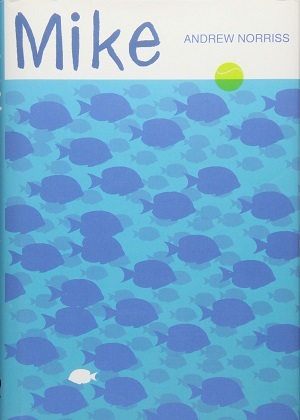 If only all books were like Mike. Suggested for age 12+ years. You can buy it here. Tom Palmer has been writing books about sport for some time, and combining history and sport to bring each of those subjects to children who wouldn’t necessarily access the other. 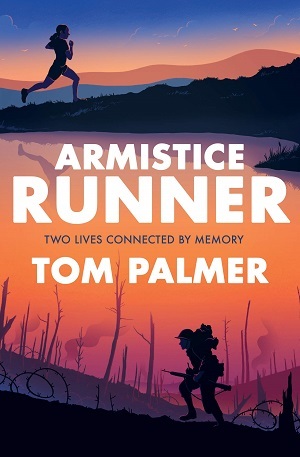 Armistice Runner is Palmer’s latest book, published in conjunction with Barrington Stoke, and placed perfectly in commemoration of the centenary. But publishing something at an opportune time doesn’t make it a success – it takes a whole host of other factors. Factors that Palmer demonstrates in abundance in his latest book – a gripping story that parallels and contrasts historical and modern, pointing to the individual to bring out the whole, and dazzling the reader with its historical research, compelling descriptions, and mostly, its massively empathetic characters. Lily is struggling to compete in her fell-running races, often losing to a rival competitor named Abbie. Maybe it’s because Lily has other things on her mind. Her grandmother has Alzheimer’s, and her father is increasingly upset by the disease’s development. When they go to visit, Lily’s running reminds her grandmother of her own grandfather – a fell runner himself, who also served at the Front during the First World War. When Lily discovers her great-great-grandfather’s (Ernest’s) diaries, they help her to make connections with her grandmother, as well as give her the confidence and inspiration to keep attacking her own runs. The book splits off into dual narratives – the reader exploring the historical diaries alongside Lily, and thus as invested emotionally as Lily herself. When she stops reading because of an incident with her family, the reader feels Lily’s frustration at being unable to dive back into the diaries and carry on, and yet the reader also wants to hear more about Lily’s story. It’s a well-concocted balance of voices. The parts of the book in Ernest’s voice are evocative of the Front (he was a runner messenger on the front lines) and yet not so gruesome or devastating as to put off young readers – a feat hard to capture. Again, the balance is just right. Descriptions of rotting flesh feel very real, as do Ernest’s emotions and friendships, and it becomes apparent how delicate the communications were during the war at the Front, particularly in the days and hours preceding the Armistice. This is a good view of the effect of war on the individual, and Palmer draws clever comparisons between the two time periods – Lily’s and Ernest’s – in terms of them both dealing with loss, loyalty, friendship and seeing things from others’ points of view. Palmer deals particularly sensitively with Lily’s grandmother. It can be confusing for a pre-teen, at a time in which they’re dealing with defining their own identity, to have a close relative mis-remember who they are. And Palmer explores Lily’s emotions in dealing with her little brother and her father with regards to their relationships with the grandmother, and her debilitating disease. It can be upsetting to see one’s parents in pain, at the same time as discovering that they’re fallible creatures themselves who don’t have all the answers. And Lily tries to have the right answers for her little brother. Ernest’s grief is also portrayed – his struggle with the loss of his brother, and seeing his own parents suffer – but Palmer brings in here the emotional release of physical exercise. Fell running is distinctive in the effort needed to run uphill and the strength of character involved, but also the freefall sensation of running downhill in fell running – the battle against one’s own instincts to hold back and retain control. The story of Lily’s great-great grandfather’s past and the lessons he learns about reaching across barriers, and loyalty to others, helps strengthen Lily’s confidence in dealing with her own rivalries, and her family issues, showing that the past really can inform the future. And I can’t help but mention how accessible the text is – both in that it has been written for publisher Barrington Stoke, (specialists in producing books for struggling readers), but also in that Palmer has two genders telling the story, and a female dominating, in the type of story (sport and World War I) usually dominated by men. If the book stimulates discussion and further study, you’d do well to look at Tom Palmer’s own website with its brilliant range of accompanying resources. And you can buy the book here. When I play trivial pursuit, it’s always the orange wedge I find hardest to win. Orange – sport and leisure. 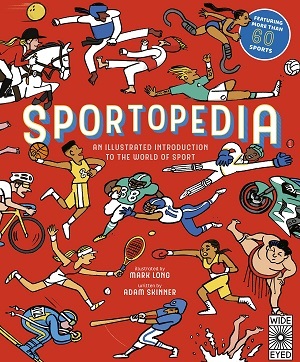 And when I look at the ‘sports shelf’ in my library, I can see our range of football books, a few on gymnastics and some lesser known sports, but there’s rarely an all-encompassing encyclopaedia of sport. Until now. Sportopedia is going to fill that void and help me win the orange wedge. Featuring more than 60 sports, this is an enjoyable, knowledgeable introduction to sports that is well-organised and easy on the eye. Split into logical sections – ball sports, racket sports, athletics, water sports and so on – each sport is afforded a single or double page spread with an introduction, a large illustration showing the sport, and then some standard ‘boxes-off’, which highlight the basic rules of the sport, as well as engaging facts. For Diving, facts include the depth of a diving pool and when diving became part of the Olympic Games. For other sports, author Adam Skinner documents famous incidents in sport and celebrates record-breakers. But there are also quirks. In Diving, there is a section on cliff diving. And in Long-Distance Running, there is a segment on ultra-runners, which made me realise that my measly 8K is no achievement in comparison to Serge Girard’s 27,011 km in 365 consecutive days. Long’s illustrations really lift the book – it wouldn’t have made sense to choose specific photographs from the millions that exist, and the illustrations strike a perfect balance between showing humour and illustrating the sport. They are also sumptuously bright, with a heavy leaning towards the primary palette, which gives the book a feeling of simplicity and ease. Although, I’m a little concerned that none of the long distance runners look as if they’re enjoying themselves, (the gymnasts certainly are). Many of the sports highlighted are accompanied by an infographic that lends authority to the book, whether it be illuminating the areas of a tennis court or the scores of a dart board. There is also mention of kit, and how names of sports, and entrants to sports, have changed over the years. What’s particularly pleasing, and necessary of course, is the diversity of all the competitors illustrated and celebrated – male, female, from many ethnicities, able-bodied and Paralympians. The ‘winter sports’ are considered in the four pages devoted to The Winter Olympics towards the back of the book in the chapter titled ‘Sporting Events’, with skiing, curling and skating among others, but there is less detail about these. But I think my favourite piece is the introduction. Explaining that sports have always existed, and that competition is part of human life and that anybody can take part. As well as talking about the lack of discrimination exercised by sport, the introduction also explains the benefits of sport – not just in the winning, but the importance of physical well-being, teamwork and discipline. And how big a part sport plays in human history. This is a fabulous book, introducing less active children to sport, promoting the rules and facts of each sport for trivia seekers, and tracking leading figures and sports milestones for enthusiasts. I might not be able to run for 365 consecutive days, but I know more about Archery and Kabaddi than I did yesterday. You can buy it here.